And with multiple caffeine based ingredients the promise to when did flomax go generic be.. Think you know horses then test your horse knowledge with our online equestrian quiz. If you believe you and your friends have the answers to questions like … Do you know what a fetlock is? What does Robert Whitaker do? Who is Charles le Moignan? When should you use a double bridle? How many ribs does an Arab horse have? Yes, well take the quiz and share your results on Facebook or Twitter, to declare whether you’re an equine schoolmaster or a complete novice. Or if you prefer a more graphical challenge why not try our horse games & puzzles. Try your hand at solving our sliding puzzles our local rider jigsaw puzzles and our beginner or advanced equestrian word search. They’re great for Horse Camp challenges. Particularly the word search and jigsaws which have timers for you to measure each others performance. Mount your pony and gallop to the end of the arena, where you’ll find an empty sack. Jump off your pony and get inside the sack. Lead your pony back to the start, by hopping and shuffling the best you can. If an individual event, the fastest to finish wins. If a team competition each team member takes it in turn until the last team member is back at the finish. The winner is the first pony to put its nose over the finishing line or in a team event the first team to get their last pony over the line. Tip: Try resting one arm across your pony’s withers to help keep your balance, while your other hand holds up the sack. Tip: Practice makes perfect, as the more you try this the better your pony will be at helping you along. A single pairs or team pairs game. The grooms race is a team game, where each pair of riders lead and ride each others ponies. The first rider mounts their own pony and leads the other riders pony through a line of bending poles. They then change over and the second rider mounts their pony and leads the first riders pony through the same course then back to the start. If a team pairs competition the next pair start when the previous pair finish. All pole bends must be completed. The winners in a single pairs game are the first riders with their ponies over the line. In a team pairs game the winners are the first team with their last pair of ponies over the line. For pairs of riders in teams of four (2 pairs). The first pair of riders gallop their ponies up the arena to a laundry line, carrying a basket of laundry between them. They hang the laundry on the line, then gallop back to the start and hand the laundry basket to the second pair. The second pair of riders gallop up the arena with the laundry basket between them, and gather up the laundry from the line. They then gallop back to the start, being careful not to drop any laundry. The winners are the fastest team to complete the task by returning all laundry items to the start in the laundry basket. All laundry items must be hung on the line and all laundry items must be collected and returned to the start. Dropped items should be picked up even if you have to dismount and remount. 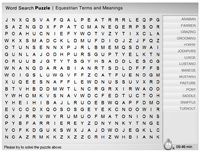 Try finding the equestrian terms in our word puzzle. It’s never the same twice and if the beginner is too easy just wait till you try the advanced. Great for expanding your equestrian knowledge. When you find most words a meaning will be displayed at the bottom of the puzzle. Now just click and drag the pieces next to each other to build the picture. 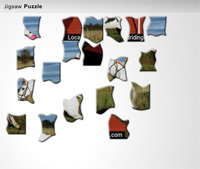 Click on the key icon at the top right to select different puzzles to try. We all enjoy horses but many of us can’t afford to own and care for one, but we still want to experience the joy of horses. Well our horse games and puzzles will help you learn about horses and acquire equestrian knowledge. It’s a little harder but more productive than sitting clicking your spacebar. But if that’s what you’re looking for the we suggest searching for Charger Escape and Penny’s Courageous Ride. They’re horse games that will help you learn a little while you play. Charger Escape is a free online horse game that challenges players to help Charger the horse escape from her stable and become a winged Pegasus. The game begins with Charger locked in her stable and players must find the key that unlocks the barn door, click on carrots and apples to feed Charger, and move around the surrounding fields to find the necessary clues to become a unicorn or winged Pegasus. Penny’s Courageous Ride is a free interactive virtual horse game that focuses on Felicity, a young girl living in the time of the British rule in America. The British government discovers her brother Ben, wants to join the Patriot army and fight the British, so Ben runs away. Felicity must use her horse to find and save her brother, who is injured and hiding in the woods. Players train Felicity’s horse to jump obstacles, such as barrels, posts and bales of hay.